• Tax reform in order to more efficiently collect due revenue and chip away at the debt without inhibiting the economy. • Congress should regularize Puerto Rico’s federal reimbursement policies of rum excise taxes to improve predictability and stability. • Streamlining, consolidation e and where appropriate, privatization, of the large public corporations responsible for $48 billion of debt. Addressing these debts is essential to stabilize the Commonwealth’s finances as a whole and to finance large unfunded pension liabilities. • Education reforms that address the Commonwealth’s needs while more efficiently stewarding public resources. • Governance reform that could allow the Commonwealth to save between $20 to $60 million from consolidation of municipalities. • Consolidation Puerto Rico’s 130 governmental agencies could save between $60 and $300 million annually. • Modernization of Puerto Rico’s labor market that addresses high employment costs and unfavorable business environment. • Exemption from the federal minimum wage, which is very high, in order to lower employment costs and incentivize employers to hire more workers. • Improvements to Puerto Rico’s budget process to enhance the transparency of its finances in order to pinpoint and resolve problems in the budget within a reasonable time. The Puerto Rico economy has been on a steady decline for over a decade, and it is now in the process of grappling with a budget crisis that has endangered its capacity to finance governmental obligations; the current outstanding stock of which totals about $71 billion. Any strategy to remedy the dual challenge of weak growth and heavy indebtedness must engage policymakers at the local, Commonwealth-wide, and federal levels. This study outlines the growth and fiscal context in which potential policy reform must take place, and examines potential elements of a pro-growth fiscal consolidation for the Commonwealth of Puerto Rico. The ultimate goal of economic and budgetary reforms in Puerto Rico should be a growing economy, and the ability of the Commonwealth to regain access to capital markets in a sustainable fashion. The growth challenge is longstanding and real. 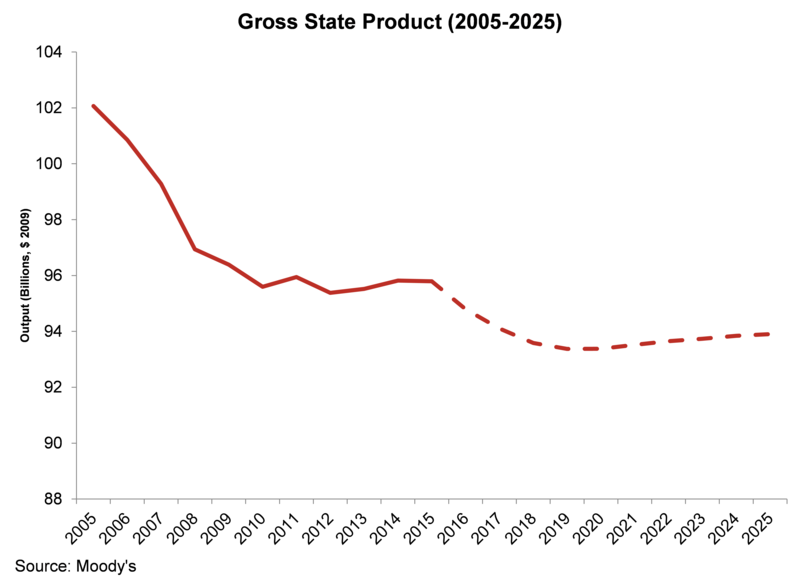 As shown below, Moody’s anticipates that, at best, Puerto Rico will have very modest growth and not until over five years from now. imilarly, the Commonwealth has a deep structural budget challenge that has led to large and persistent budget deficits. 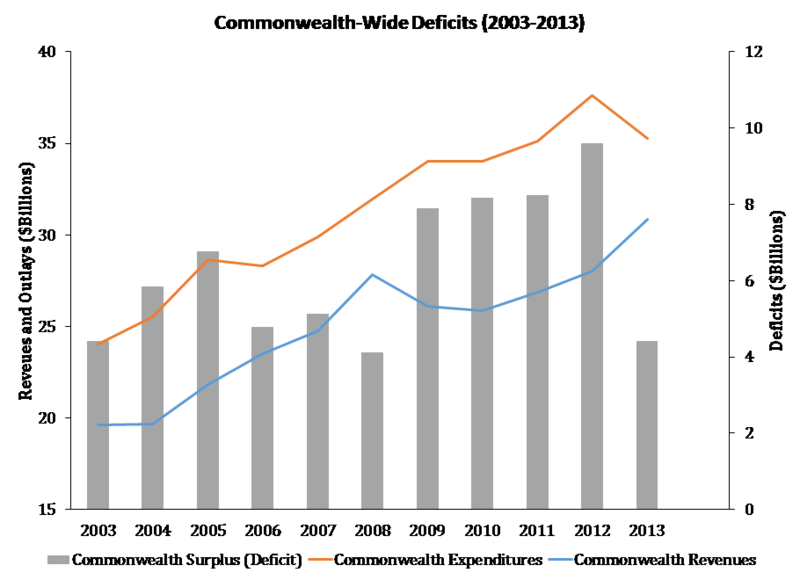 Note that these reflect not only general fund deficits, but commonwealth-wide activities. Rectifying these deficiencies will necessarily involve some difficult choices. 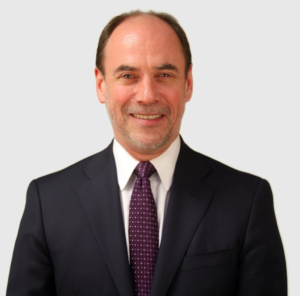 However, it is important to put in context the Commonwealth’s capacity to absorb consolidation, its ability to restrain spending, its levels of taxation, and the size of its indebtedness. Indeed, it is a common assumption that Puerto Rico has engaged in protracted austerity and, despite this, is over-taxed and over-leveraged. The data do not support these assumptions. Consider first the amount of government spending in Puerto Rico. Despite attempts to scale back spending, Puerto Rico has failed to significantly reduce budgetary expenses. 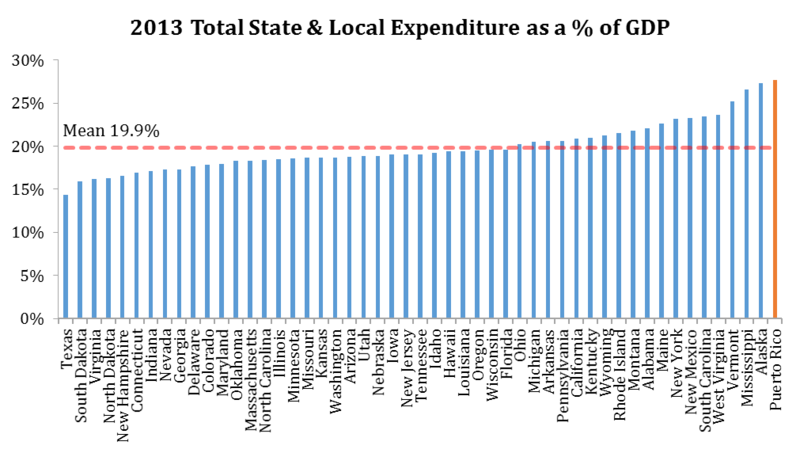 Looking at Figure 3, it is evident that Puerto Rico has ample room to reduce government spending when compared to the U.S. states. Puerto Rico is well above the mean in this calculation which supports a capability of reduction. It is essential for the economic stability of Puerto Rico to prioritize the funding of essential programs and debt while at the same time reducing other spending. Previous research indicates that it is valuable for Puerto Rico to preserve core functions of government while focusing spending reductions on transfer programs. On the other side of the ledger, tax collections as a percent of GDP for Puerto Rico are actually lower, at 11 percent, than any other U.S. states. Similarly, the idea that Puerto Rico is dramatically over-leveraged is another misconception surrounding the Commonwealth. 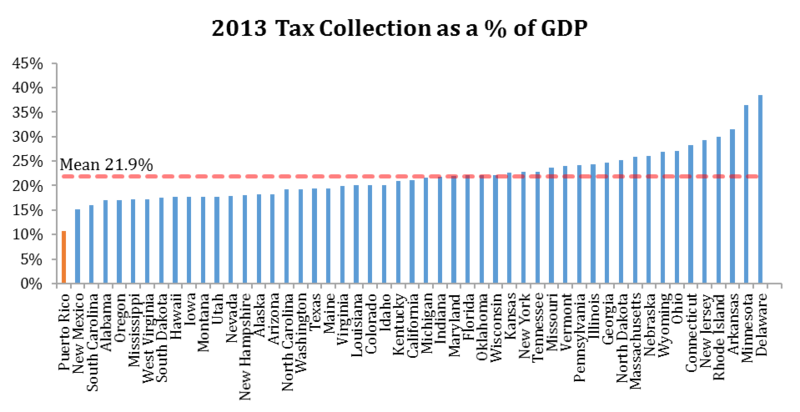 Looking at total debt as a percent of GDP (with and without unfunded pension and other post-employment benefits [OPEB]) Puerto Rico is well below the mean and median when compared to the mainland. Looking at the total debt including unfunded pension and OPEB, Puerto Rico has debt equal to 98 percent of its GDP; substantially below the states’ median of 120 percent. Taken as a whole, the data depict a Puerto Rico that has poor growth, or actual decline; an overly large public sector; and a revenue base that simply is too small to finance it. This mismatch will ultimately lead to irreversibly large debt burdens, but that has not yet occurred. There remains time to address the growth and budget challenges. Puerto Rico must take the lead in charting a course beyond its current economic and budgetary torpor, which means any fiscal consolidation must first involve self-initiated reforms. Puerto Rico’s tax measures need modernization which can ultimately generate funds to chip away at the debt without inhibiting the economy. 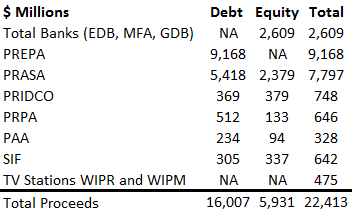 The debt portfolios of Puerto Rico’s large public corporations – with on the order of $48 billion in debt outstanding – must be addressed as part of a growth plan for Puerto Rico as well as pension liabilities. Additional savings can be achieved in other areas of the Commonwealth’s budget. One example is in education spending, where savings can be achieved without harming educational attainment. The Commonwealth must also make structural changes at the municipal level by streamlining local administration. These measures should be paired with reforms that enhance labor markets, an essential element of a pro-growth consolidation. As part of this reform effort, and to gauge budgetary and economic progress, the Commonwealth must undertake meaningful budgetary process reform that enhance the transparency of its finances. Tax reform and administration can play an important role in improving Puerto Rico’s budgetary trajectory. This should include a needed modernization of its current tax compliance tax system, including the property tax system, to more efficiently collect due revenue. Puerto Rico has a substantial problem with the collection rate of its Sales and Use Tax (SUT) that is noted in both Krueger’s and the governor’s plan. At 56 percent, Puerto Rico’s collection rate is significantly lower than the U.S. states’ total tax collection rate of 83 percent. By improving the Commonwealth’s SUT tax collections to 65 percent-70 percent (still well below the U.S. states’ total tax collection rate), Puerto Rico could yield approximately $100 to $150 million in annual receipts. The collection rate can be improved by using a quasi-independent government agency (similar to the federal IRS) or a Public Private Partnership to assign taxes. Another outdated system needing modernization addressed in the Krueger and Governor’s report alike is the property tax. The Krueger Report estimates that revamping the property tax can yield $100 million for 2016 increasing to $350 million by the year 2018 by reevaluating the assessed real-estate values (currently from 1954), updating the registry and adjusting down tax rates. A transition period using discounts—based on income-level and change in tax due—could be used to ease the burden of the increased valuation. Since Municipalities normally retain the property taxes, the central government revenue could cut its transfers to municipalities by the amount of additional property tax receipts. Puerto Rico has the opportunity to benefit from the consolidation and privatization of the public entities responsible for issuing $48 billion in debt. The funds generated and debt removed in the process can be repurposed to finance a growing unfunded pension. Public Private Partnership (P3) initiatives can benefit the Commonwealth by alleviating debt, unfunded pension, and OPEB liabilities while reducing the outsourcing of government expenditures. Another side benefit of P3 initiatives is a lower cost and better service for customers; the result of private corporation structures improving the current inefficient system. Examples of P3 statute success include the Luis Munoz Marin International Airport, PR-22 & PR-5 toll roads, and 21st Century Schools project. Public Private Partnership is also present in the Governor’s plan. PREPA can benefit by pursuing P3 projects for its power generation facilities or for developing the infrastructure intended for the transportation of Liquid Natural Gas. Doing this lowers power generation costs, generates new jobs for its residents, while eliminating debt financing costs. PRASA can improve profitability by refining water collections, reducing operation costs, and increasing usage rates. The major government-owned insurance corporations could be consolidated and privatized. Consolidating and partially privatizing the EDB, MFA, and GDB could reduce overhead expenses and finance IRR projects for the development of Puerto Rico. The potential developments include infrastructure projects, microfinance institutions, and other economic development initiatives as well as providing capital to small and medium sized enterprises to reduce volatility and having programs available to encourage foreign direct investment. The estimated effects of consolidating and privatizing specific public corporations can be found in Table 1. Pension costs continue to be a rising problem for Puerto Rico where the current unfunded pension nears $36 billion. In order to resolve this issue, Puerto Rico can change all pensions to defined contribution plans, increase the minimum retirement age, and increase employee contributions. Education reform is another necessary measure to conserve funds unnecessarily subsidizing the University of Puerto Rico (UPR) as well consolidate the excess spending on schools and teachers. The University of Puerto Rico is heavily subsidized by the commonwealth as all UPR students benefit from a blanket subsidy. The flat rate that the UPR students pay is far lower than many schools on the mainland. Educational support could be shifted to a need-based scholarship approach to reduce the General Fund’s spending without hindering those reliant on the subsidy. Krueger estimates that a program such as this can reduce spending $500 million by FY2020. Turning to the K-12 system, in the past decade the number of students in Puerto Rico dropped 40 percent while teachers increased 10 percent. This created an average student-teacher ratio of 12 which is considerably lower than the median for the mainland of 16. Krueger finds that a gradual cut in the number of teachers saves approximately $400 million per year by FY 2020. Another cost reducing reform incorporated in both the Krueger and Governor’s report is a consolidation of schools. By reducing the number of schools, the remaining will be able to invest more in modern facilities and better technology. The governor’s report estimates that consolidating schools and reducing Puerto Rico Department of Education payroll is expected to save $50 million in 2017 growing to approximately $225 million in 2020. With 50 of the 78 municipalities operating at a deficit, the Commonwealth could benefit from regionalizing its less financially stable municipalities. Smaller municipalities spend 98 percent of their budgets on payroll, according to Bayamón Mayor Ramón Luis Rivera Cruz, which can be consolidated to reduce operational costs and improve tax revenues while providing more services for the people. The Commonwealth could save between $20 to $60 million from consolidation of municipalities. The Commonwealth could also save between $60 and $300 million annually by consolidating Puerto Rico’s 130 governmental agencies. Another measure that needs to be made at the Commonwealth level is the modernization of the labor market. The employment costs are too high and other laws make doing business burdensome in Puerto Rico. The local labor laws of the Commonwealth are problematic to the employee base by supporting an unfavorable business environment. In order to overcome this problem, Puerto Rico needs to alter the laws that magnify employment costs: defining overtime as any time spent working in excess of an 8-hour day, 30 paid vacation days compared to the norm of 15, mandatory end-of-year bonus, and Sunday premium pay. Puerto Rico also needs to change the laws that disrupt the ease of business: onerous requirements for laying off employees compared to the mainland and a probationary period of only 3 months. The reform of these local labor laws is supported in both the Krueger and Governor’s report. Additionally, vocational training could be subsidized to advance the skills of Puerto Rico workers while reducing the employment costs related to business hiring. Another problem with investing in Puerto Rico is a local permitting process that it is disorderly and not centralized. One reform backed by the Governor’s is to issue Executive Orders designating strategic emergency areas for expedited permitting processes in select-essential infrastructure and service projects. This is the quickest and easiest means of attaining improvement without the need for legislation. Another reform that would streamline the process is to modify the language in the Permit Process Reform Act. Current reviews and approvals take too much time to conclude and, due to the multiple agencies involvement, are redundant. By consolidating all the infrastructure and environmental related permits in the State Office of Permits Management, reviews and approvals will be much faster and effective. Another suggestion is to integrate all of the municipal permitting processes Commonwealth’s existing permit filing and processing platform centralizing the process. The Commonwealth needs to improve the budget process, especially the budget’s transparency, in order to pinpoint and resolve problems in the budget within a reasonable time. The Commonwealth did not pass a balanced budget for the general fund in 5 of the past 6 years. Furthermore, the government has failed to report annual financial statements within 305 days of each fiscal year in 9 of the past 13 years. Meanwhile, there remains considerable skepticism over the the accuracy of relevant budget data. The lack of urgency to get the budgets passed in a timely manner is detrimental to Puerto Rico’s ability to turn around its fiscal situation which is a concern evident in both the Krueger and Governor’s report. There are a number of policy reforms Puerto Rico must undertake to improve its economic and budgetary outlook, but those alone will not adequately address Puerto Rico’s challenges. There are also a number of reforms needed at the Federal level to increase the labor force and reduce expenses on the island. Puerto Rico is in part dependent on the vicissitudes of federal tax writers owing to its reliance on federal reimbursements of rum excise taxes. These reimbursements are currently based on an enhanced, “temporary” basis, that is routinely extended in Congress’s annual tax “extenders” package. If this package is not renewed, Puerto Rico and the U.S. Virgin Islands would receive lower reimbursements – a combined $168 million in subsidies. As part of broader tax reform measures, Congress should regularize its tax policies to improve predictability and stability. Puerto Rico has a significant problem with a labor force that continues to decline. This problem stems from Federal regulation hindering the Island’s ability to set compensation for its workers and is agreed with in the Krueger and Governor’s report. The Governor’s report finds that only 40 percent of the adult population are employed or looking for work compared to 63 percent on the U.S. mainland. Minimum wage laws contribute to the abysmal labor force participation rates by inflating employment costs. The U.S. federal minimum wage is very high relative to local average where minimum wage is equivalent to 77 percent of per capita income compared to 28 percent in U.S. states. Puerto Rico needs to be exempt from the federal minimum wage in order to lower employment costs and incentivize employers to hire more workers. The Krueger report estimates the income taxes raised from higher worker participation to be $50 million in the early years and quickly growing. Another reason for the low labor participation rate is the welfare system providing generous benefits often exceeding that of minimum wage employment. One estimate from the Krueger Report shows that a household of three eligible for food stamps, AFDC, Medicaid and utilities subsidies can receive $1,743 per month compared to the minimum wage earners take home earnings of $1,159. As of now, there is no incentive to join the work force because of this discrepancy between benefits of workers and non-workers. In order to combat this problem, the Federal government could give the Common wealth the ability to adjust welfare requirements and benefits accordingly; such as, continuing food stamps for a while even after a person returns to work, providing lower housing benefits to more people rather than higher benefits to a few, and cutting back on Medicaid benefits paid out over and above the Federal minimum standard. These suggestions for lowering the welfare system’s generous benefits are supported in the Krueger report. The Jones Act is another legislation that needlessly increases the costs on the island. The Jones Act does this by requiring the use of American crew and U.S. manufactured vessels on all shipping routes where the origin and destination are within the United States and its territories. Puerto Rico’s inclusion under the Jones Act results in Puerto Rico import costs twice as high as neighboring Caribbean Islands. This issue of high transport costs is present in both the Krueger report and the Governor’s report where it is suggested that Puerto Rico be exempt from the Jones Act. Despite there being exemptions in other U.S. territories (the U.S. Virgin Islands and Guam), Puerto Rico continues to be overruled with a rejection as current as earlier this year. A more lawmaker friendly proposal is to exempt Puerto Rico from the Jones act for specific imports, such as energy/fuel and food which would drive down the costs of living on the island. The lowered costs from this exemption could feasibly invite more tourists as well as retain the fleeing workers. To improve its budgetary and economic outlook, Puerto Rico must embrace a multi-layered and multipronged fiscal consolidation that also enhances labor and investment opportunities in the Commonwealth. This approach should recognize the Commonwealth’s wherewithal to absorb difficult choices, while improving long-term economic growth. These reforms should focus on reforms to the Commonwealth’s tax system, and directing savings towards Puerto Rico’s public sectors. Additional reforms should improve Puerto Rico’s investment climate and spur domestic economic activity. This table uses data for state and local expenditures as well as Puerto Rico expenditures from the census and the OMB of Puerto Rico OMB respectively to calculate expenditures as a percent of GDP. This number is calculated using the total tax revenues divided into the GDP for each of the states and Puerto Rico. The GDP data is from the Bureau of Economic Analysis for the states and from The World Bank for Puerto Rico. The data for tax revenue is from the Annual Survey of State Government Finances provided by the Census for state and local tax revenue, the IRS for federal tax revenue, and the Government Development Bank for Puerto Rico (GDB) for the tax revenue of Puerto Rico. The debt for the states can be found using the Annual Survey of State Government Finances provided by the Census as well as the Federal Debt Securities held by the public provided by the US Department of Treasury. Furthermore, the debt for Puerto Rico is available at the GDB. The state’s unfunded pensions and OPEB is available at the State Budget Solutions while the numbers for Puerto Rico are from the Basic Financial Statements and Required Supplementary Information from the GDB. The higher percent of total debt/GDP for each state and Puerto Rico includes unfunded pension and OPEB. 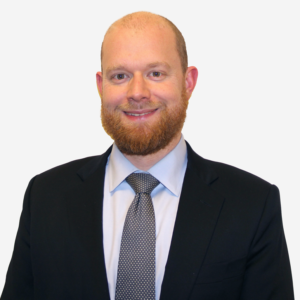 Curtis serves as data analyst at the American Action Forum.